The Student Record is a particularly valuable tool for teachers and administrators. Each student has a Student Record that includes information designed to highlight a student's progress. It includes the student’s list of classes, attendance, the assignment calendar for that student, all progress reports published by the student’s teachers (School Loop Grade only), login information, a list of all members of the student’s learning management team and much more. This article outlines the required steps for locating the student records. This page contains the bulk of the information available on the student record including grades, weekly calendar, current assignments list, class schedule, members of the student’s learning management team, and intervention discussions. This article gives more information about the academics section on the students' record. This page displays the students' attendance for the year. You can also view daily attendance or attendance for the year from the dashboard. All staff may participate in discussions pertaining to the student via the Student Record. Intervention topics are listed on the Dashboard page in the Interventions section located in the column to the right. A list of topics can also be found by clicking the Interventions tab near the top of the page. 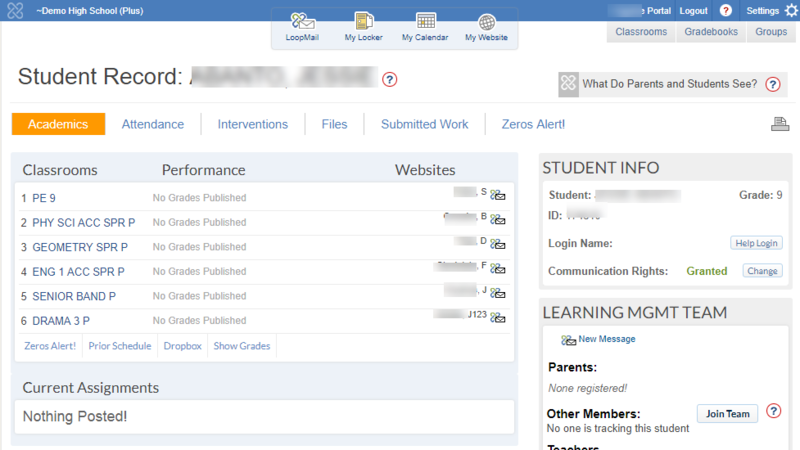 Each post is emailed directly to the teachers in the student’s Learning Management Team. Additionally, these discussions are listed on the portal for the staff members of the Learning Management Team. However, these discussions are not viewable by students, parents, or associates. All staff may upload files pertaining to the student in this section. Such files might include IEPs or 504 plans. These files are not viewable by students, parents or associates. A complete list of work turned in online by the student will be shown here. Each file has a submission timestamp and may be downloaded. Students have their own list of turned in work on their account portal. This section displays the list of all assignments in all classes where the student currently has a zero score. 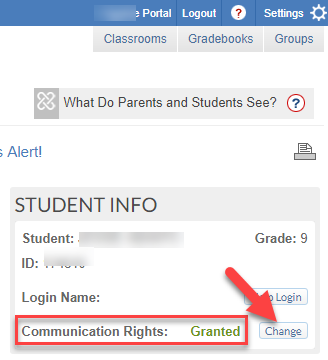 Any teacher or staff member can grant or revoke a student's communication rights from the Student Info box on the right side of the Student Record. Toggling the Change button will block the student's ability to send LoopMail messages. They will also no longer be able to post messages to assignment or group discussions or upload files to any lockers except for their personal locker.